were on tour. were in weird cities where people get a chance to help out! Its awesome..its snowy but were here…itll be warm soon..! here is some news of the tour..
were all over…here are our dates. Also check what HipHop DX said about myself Jay-Z, U2 and Swizz Beats! 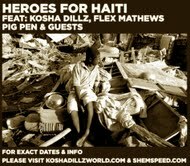 Here are the “Heroes for Haiti” tour dates and its press release. real face to face contact, the way all heroes should interact.